Samuel Hoffman | The Journal Gazette Phil Karsting of the USDA speaks Monday at Grand Wayne Center. Samuel Hoffman | The Journal Gazette Participants at the Indiana Forum gather for a break between sessions Monday at Grand Wayne Center. 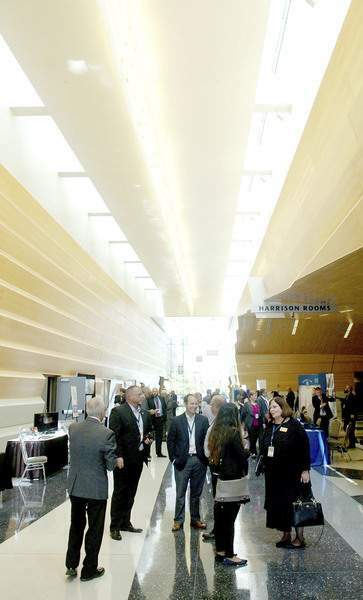 In what was called a first-of-its-kind gathering, Indiana business leaders met Monday with federal officials and foreign diplomats to talk about ways they can expand international trade. 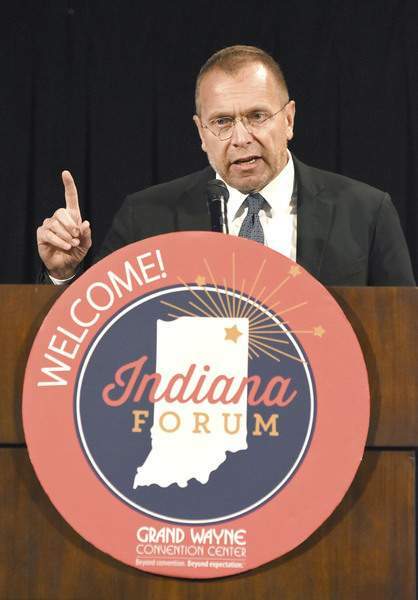 The Indiana Forum attracted more than 350 people to Grand Wayne Center for a series of roundtable discussions and presentations on an assortment of topics, including taxes, tariffs, regulations, transportation infrastructure, intellectual property and refugees. Pete Eshelman, the forum chairman and co-owner of the Joseph Decuis restaurant in Roanoke, said the goal was to establish relations between Hoosier businesses and federal agencies. "How can we grow our businesses in northern Indiana globally, what are the opportunities, and then what are the barriers that get in the way," he said in an interview. More than 30 officials representing more than a dozen federal agencies participated, as did diplomats from nations that included Australia, Poland, Romania, Slovakia and Guinea. "Now we’re on the radar," Eshelman said. "Now these people know who we are, what we’re doing, what our aspirations are, what our assets are, what our growth opportunities are. "We’ve all got to work it." The U.S. State Department said Monday’s event was the first such forum in its "Engage America" public outreach initiative. Jeremy Pfister of Fort Wayne Metals said in an afternoon presentation that an earlier round­table gave participants the opportunity to "sit down, talk and develop relationships." Pfister’s group consisted of medical device makers and suppliers. They discussed patent protection, technological advances by the Department of Veterans Affairs, taxes and regulations. Other group discussions were devoted to agriculture, defense and aerospace, manufacturing and entrepreneurship, education, faith and human rights, and local government. Sen. Dan Coats, R-Ind., was brief but blunt in his keynote speech to the forum. "Almost every business person I talk to says, ‘I’m getting killed with regulation,’ " Coats said. At 77,000 pages long, the U.S. tax code "is simply out of control." Coats, a former U.S. ambassador to Germany, said Hoosier business operators are concerned about the availability of workers with STEM skills – science, technology, engineering and math – and what they see as a shortage of hard workers among young adults. "Instilling the work ethic today among the younger generation seems to be a major problem. … I hear that over and over and over," he said. Coats was scheduled to speak again to the group during a dinner scheduled at the Joseph Decuis Farm.